The Datamax M-4210 has double the memory of it’s little brother (the M4206), a 150MHz processor, and 10″ per second print speed or 254 mm per second! With increased productivity, choose one printer that does it all. SKU: KJ2-00-4N000Y07. Categories: Industrial Printers, Label Printers. The M-Class Mark II Printer is a compact, industrial printer that offers outstanding value with a broad range of features. The smaller footprint of the Datamax M-Class is ideal for users who need the power of industrial printers but must consider space limitations. 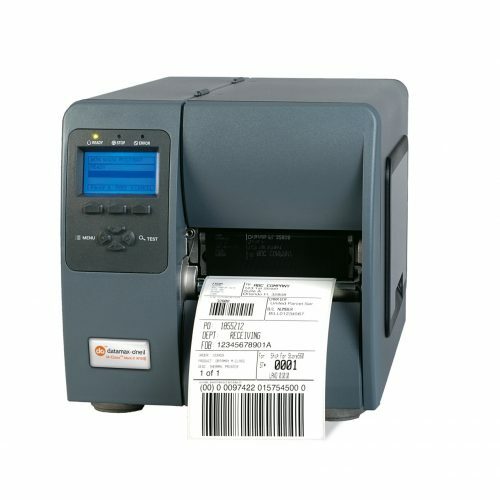 The M-Class label printer is a perfect solution for warehouse, healthcare, logistics or retail applications. The modular design of the M-Class barcode printer makes maintenance and part replacement easy, and the flexible design allows a variety of options to be upgraded in the field. M-Class Mark II reduces the total cost of ownership with easy to maintain components. The Datamax-O’Neil M-Class offers a broad range of connectivity to meet diverse application requirements and easily integrate into any network. With an easy to navigate LCD graphics display for menu and printer function control, the M-Class label printer is designed for any level of user. Support of UHF or HF RFID configurations for current or future requirements protects your printer investments. The high quality features, performance, and rugged reliability make the M-Class Mark II printer the best value of any printer on the market. Increased productivity – The Datamax-O’Neil M-Class Printer keeps up with high label demand applications, boasting 32% faster performance than the nearest competitor in its class. The modular design and field-installable options cut back on downtime and improve efficiency. With its unique form factor, the M-Class Mark II fits easily in tight spaces where work space is a premium. One printer does it all – The M-Class barcode printer can be used in a wide variety of applications with a range of media compatibility, emulation support and options. It is easy on the budget with the best value proposition for an industrial strength printer.